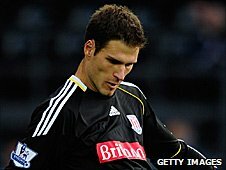 Goalkeeper Asmir Begovic believes Stoke City are making good progress, despite losing 1-0 at Arsenal on Wednesday. An early goal from defender Sebastien Squillaci proved the difference between the two teams, although Begovic said Stoke can be proud of their display. "We're developing as a team," Begovic told BBC Radio Stoke. "We're coming to these places and giving teams a right go for long spells." Stoke are 10th in the Premier League, six points above the relegation zone. Their next game is against West Bromwich Albion at the Britannia Stadium on Monday. The Bosnia international added: "We all realise it's a big game. "We're satisfied with our performances lately and at home we fancy ourselves. It will be a tough game though, they're a great side with a great manager." The Baggies needed an injury-time equaliser from Arsenal loanee Carlos Vela to draw their first match under new boss Roy Hodgson against local rivals Wolves on Sunday. A penalty from Matthew Etherington and a brace from Jon Walters gave Stoke a 3-0 victory at the Hawthorns in November.